The problem is that it is an amateur syndicate run by one person. No disrespect to David who runs it, as he does a sterling job. And some people may actually prefer an amateur syndicate. But this is the big debate. Personally I’ll always favour a professional company taking my money and managing my entries. It’s certainly not the only factor but when everything else is right, a company like Love My Lotto gives me a much better feel good factor – even if it does cost me a little more. 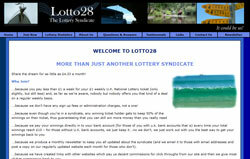 Lotto 28 plays the UK Lotto Saturday night draw. The clue is in the name as each syndicate group is made up of 28 people. This is too small really, but is partly made up for by the way David splits out the winnings. Each player picks their own set of numbers. If the numbers you chose win, then you get 50% of the prize. Another 45% of the prize is shared between the other 27 members in your group. The remaining 5% is shared between the members of all the other groups. That does mean you get a small share in the winnings of all the other groups. So if another group hit the jackpot and you didn’t, you could afford to drown your sorrows on their good fortune. The basic cost is just £4.33 per month to join one group. You can join multiple groups if you want to (so two groups is £8.66 etc). Payment options are limited and you can’t just join online unfortunately. You can pay by standing order or cheque. Standing order is probably easiest once you’ve set things up with your bank, and posted the signed agreement form to Lotto 28. Maybe. The chap who runs it has proven keen and reliable. Hopefully things will stay that way. But illness or boredom is always a risk with amateur syndicates. If you want very low budget, this is a good option. But personally I think it’s worth paying more a bit more infrastructure and the reassurance that offers. Good track record, small share in all groups winnings. Small group sizes, limited payment options, amateur syndicate. Lotto28 have now closed down. Try You Play We Play instead.